PAHMIR (also called: Predictive Health Monitoring for Aircraft Systems) was a joint research project. The duration was nominal 3 years. The research grant was given to the university on 01.01.2008. 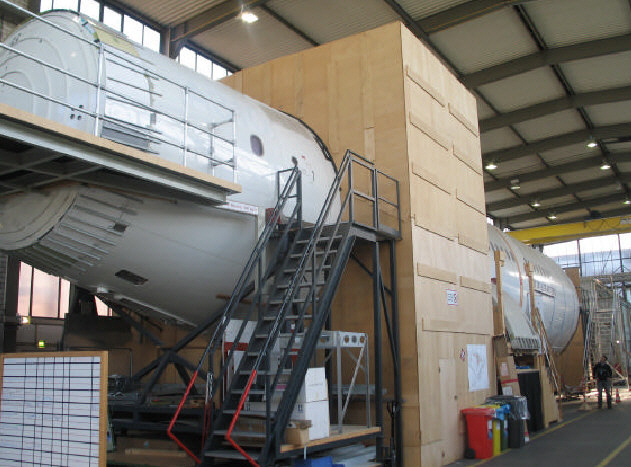 The project ended on 30.06.2011.
b) error detection and diagnostic systems for preventive maintenance of cabin systems. b) to build error detection and diagnostic systems also economical for smaller (less expensive) components in cabin systems. 3.) the development of a demonstrator of an error detection and diagnostic system that has to be installed into the Maintenance Technology Test Center (MTTC) (see picture) at Airbus, Hamburg. b) decrease maintenance costs through preventive maintenance - enabled by employing error detection and diagnostic systems. The HAW-Part in PAHMIR (195900 EUR) was financed by LuFo HH, a programme of the government of Hamburg, the Ministry for Economics and Labour (Behörde für Wirtschaft und Arbeit - BWA). The grant was administered by the Projektträger Luftfahrtforschung und -technologie, DLR for the BWA and the Hamburg Innovation GmbH for the HAW Hamburg. Researcher in full time employment for PAHMIR was Dipl.-Ing. Mike Gerdes.